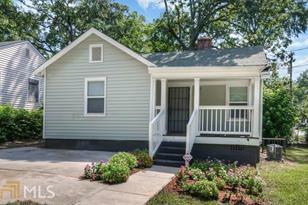 Completely Remodeled in East Point home under $150k. 3BDS/1 BA, with high end kitchen, custom cabinets, incredible granite counters, hardwood floors, tile in bath and kitchen, even all new double pane windows, new HVAC. Top to bottom this house will impress. Corner lot with driveway in the front and separate one to back door, fully fenced back yard. Super close access to I-85 and ATL airport. Many more remodels going on all around and most are much more expensive, so get in before prices get too high. Driving Directions: I-85 to exit Cleveland Ave, go west and take a left just past Norman Berry on Randall St.
2876 Randall Street, East Point, GA 30344 (MLS# 6513092) is a Single Family property with 3 bedrooms and 1 full bathroom. 2876 Randall Street is currently listed for $139,900 and was received on March 01, 2019. Want to learn more about 2876 Randall Street? Do you have questions about finding other Single Family real estate for sale in East Point? You can browse all East Point real estate or contact a Coldwell Banker agent to request more information.